The amount, source, and composition of the sludge to be processed determine the overall size of the alkaline stabilization facility. Equipment capacities must be sized to accommodate raw sludge storage and feed, chemical storage and feed, and stabilized product storage. Dosages of lime vary considerably for different types of sludge; for example, compared to primary sludge, waste activated sludge typically requires double the dosage of lime per unit dry weight of sludge solids. Compared to raw sludge, anaerobically digested sludge contains five to eight times the concentration of ammonia nitrogen, which is released from sludge in gaseous form at the elevated pH required for the alkaline stabilization process. Consequently, the potential for odors from ammonia and other nitrogen compounds such as amines is increased, and odor control facilities may be required, depending on the intensity of the odors and proximity to residential and commercial areas. The solids concentration of sludge to be stabilized has an effect on the process because it affects the chemical dosage and facility sizing. 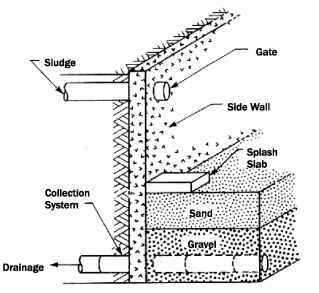 The nutrient content of the sludge affects the characteristics of the final product. The agronomic benefits of alkaline-stabilized biosolids depend on the amount of plant nutrients contained in the biosolids.